The Calgary Flames have acquired goalie Mike Smith in a trade with the Arizona Coyotes. They sent goalie Chad Johnson, prospect Brandon Hickey and a conditional third round draft pick in exchange. Johnson was set to become an unrestricted free agent come July 1, while goalie Brian Elliott is in the same boat. With those circumstances in mind, it’s hardly surprising the Flames moved on Smith. The 35-year-old is a solid pickup for the Flames. He was 19-26-9 last season with a 2.92 goals against average and a .914 save percentage in Arizona, but he’s a big goalie at 6’4 and covers a lot of the net. He’s also a good puck-handler and can aid in fuelling a rush out of the defensive zone, so that could open up some options for Calgary’s attack. Smith has 11 years of NHL experience under his belt and he’s been a durable goalie. In 2011-2012, he suited up for 67 games with the Coyotes. 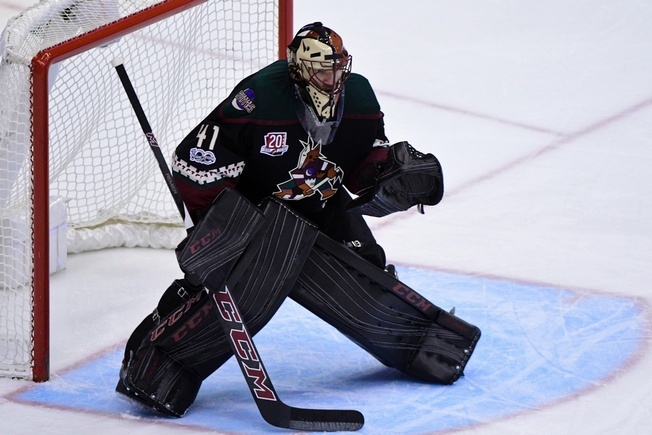 He won 38 games that year and posted eight shutouts, with a 2.21 goals against average. The Flames may be a way off from getting that version of Mike Smith, but there’s still plenty of gas in the tank. Just this past season, he faced 60 Columbus shots in a December 3 game. Smith has two years to go on his six-year deal, which is to the tune of $34 million, and he’s got experience working with Treliving in Arizona. The current Calgary GM was the assistant general manager of the Coyotes from 2003 to 2014.